Meeting Dr. Albert Bandura. 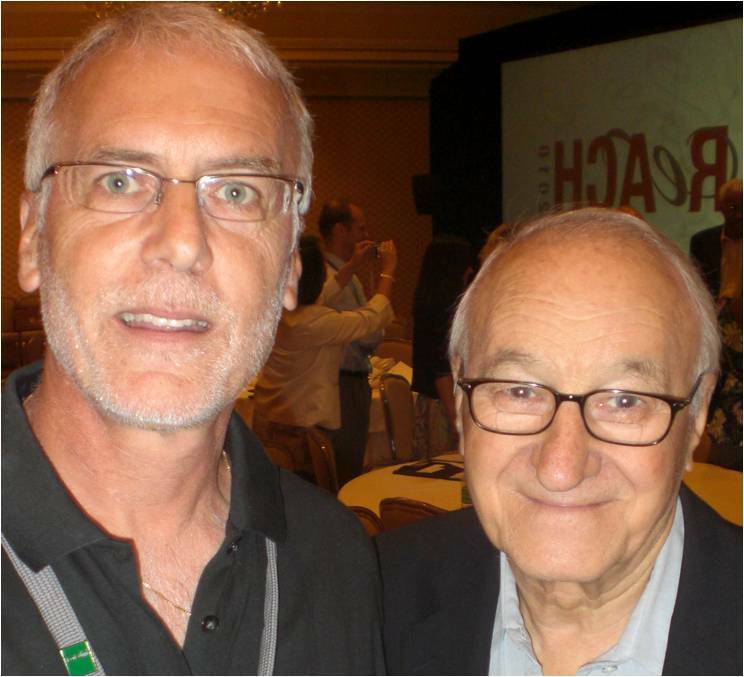 It was my pleasure and honor to spend a bit of time with Dr. Albert Bandura, the most famous living psychologist, in Salt Lake City at Reach 2010, and to attend his one hour presentation on his work. I was encourage by his knowledge and information, moved by his humility and engagement in the whole conference, and inspired by his keen insight and hard work at 85 years of age. The conference was sponsored by Vital Smarts. Self-Efficacy + Employee Engagement = Powerful Engagement for Results. Dr. Bandura said a number of things during his one hour presentation that I related to employee engagement. I will summarize a few of his his statements in bold at the start of each paragraph then add an explanation of the connection to engagement. Don’t front load imagined difficulties. If you are launching an employee engagement initiative don’t focus too much on the problems ahead or you will never move from dream to reality. Be realistic about the odds and optimistic about the means. Of course between belief and success there is a lot to do in between. Personally, this was very encouraging for me with my WILD dream of a 20% global increase in employee engagement by the year 2020. Leverage the 4 sources of self-efficacy. Don’t confuse self-esteem, having a good view of yourself with self-efficacy, your belief about your ability and capacity to accomplish a task or to deal with the challenges of life. I love the action embedded in self-efficacy and that employee engagement is not some sort of feel good thing. Self-efficacy is derived from mastery experiences, modelling, social persuasion, and stress resilience. Help employees to experience mastery of their work and then add challenges as mastery unfolds. Leverage social persuasion by fusing faith in employees while simultaneously arranging situations for their success. Highlight credible models of engagement. Help employees develop stamina while reducing anxiety and depression so they know they can do what is necessary to produce a certain outcome. To move forward we need goals and feedback. We need goals and feedback. Distant goals can inspire the dream while close goals tells us what to do right now. With a sense of high efficacy and high discontent people will redouble their efforts. Ensure that you not only help employees set goals but ensure they keep getting feedback along the way. Avoid the 4 ways of subverting healthy self-management. Don’t temporize by believing that you will have more time tomorrow. Avoid dawdling – getting lost on trivial things such as constantly checking the email. Don’t detour by doing other things first, seize the crucial moment and do what needs doing right then. Stop Excusing of finding reasons why you are not engaged. May the efficacy force be with you. Learn to make the most of self-efficacy for your own engagement and to contribute to the employee engagement of all employees. To learn more read the Wikipedia entry on self-efficacy and to develop extensive knowledge of Bandura’s work visit the incredibly resource rich community of scholars site on self-efficacy from Emory University. even if I may not have it at the beginning. David Zinger, M.Ed., works with organizations and individuals to foster engagement. He is a writer, educator, speaker, and consultant who founded the 2870 member Employee Engagement Network. David’s book, Zengage: How to Get More Into Your Work to Get More Out of Your Work will be released this September. David’s website offers 1100 free posts/articles on the engagement. David is committed to fostering a movement to increase employee engagement 20% by 2020.